Bivouac has a pretty descent sale on at the moment so we’ve pushed the big red ‘buy now’ button on two sleeping bags, sleeping mats and travel pillows. The technology has come a long way since the 90s and we’ve been blown away by the increase in comfort available. We’ve purchased sleeping mats that are essentially very high tech, lightweight and compact air mattresses. They are a big step up from the old ‘retired’ compressed foam versions. The new sleeping bags are about half the weight of our old ones and offer the ability to sleep in -16C and not die from hyperthermia – good to know! Although realistically, if the temperature even thinks about going anywhere near zero, I’ll be on the first train south! The pillows were an added luxury but after much consideration we figured that if the camping thing (with its associated cost savings) is going to fly for the full gap year, then a minimum sleeping comfort must be achieved. They are pretty light and small, and also double as added comfort on long plane, train and bus journeys. At the moment they feel a bit of an indulgence and strictly unnecessary but the rationale is that if they don’t fit once we’ve packed, we can always leave them behind. We also bought the most high tech cutlery ever! It’s titanium airplane technology, incredibly light and, more importantly, real cutlery rather than a mutant eating appliance. Research is still being completed on cooking equipment and head-torches. 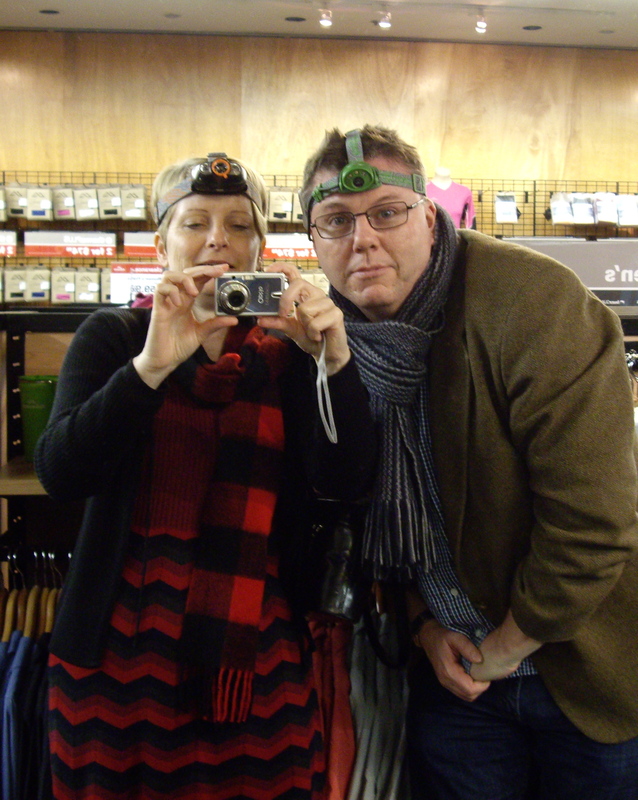 The Husband is VERY keen on a head-torch and academically I can see the sense in them but, having tried on a couple, I’ve come to the conclusion that they make you look very silly. I know that obviously you are in the dark, in a camp ground and probably alone, so it’s probably not high up on the list of sartorial faux pas BUT I just hate buying ugly things. I think the solution is going to be that we buy a communal head-torch that can be used by the person in most ‘need’ (guaranteed, this will be the Husband most of the time) with a simple torch for backup – I quite like the solar powered ones. Do these work? Perhaps some experimentation is required … I can just see us camping overnight in our living room to test out all the new toys! I’m starting to think about the route for the trip and flesh it out a little from the initial ‘right, down, up, left‘ plan. I recently read a post on the Burgundy Canal route that looks very inviting and is definitely in the ‘must do’ basket. We will also need to visit Lille, where we used to live, and of course Paris. Copenhagen is a must do stop and I very much would like to visit Berlin as the wall was still up last time I was there! I’m thinking of working from the inside out … marking on a map all the places that we want to visit and then figure out a route to join them up. I am wondering if there is an online method of planning a trip and plotting a route. If anybody knows of something, please let me know. You can also by slim mag lite type torches complete with a head band for when you need to be hands free. @ Vinny – I like that idea! We also came up with the idea of attaching extra solar powered bike light onto our bikes during the day and then clipping them off for use around camp in the evenings. The thought of a years worth of batteries seems less than environmentally responsible. I’ve looked into solar powered camp lights but they all seem to be quite large – any ideas on that one? Another option is a USB charged head torch. The wilderness stores are now advertising a camp stove that runs on twigs and uses heat to create electricity and so has a socket for recharging phones etc- sorry just saw this on a flyer so have no more details but is called a Bio lite.